• Our first new library addition this month is an article by Mother Macaria Corbett, “The Angel of Light and Spiritual Discernment in the Orthodox Tradition”, on the subject of spiritual delusions, prelest in the Russian terminology, “a wounding of human nature by falsehood”. The first rule of unseen warfare is “distrust of self to one’s dying day.” What can be more bewildering to the beginner than this distrust of self? It is anathema to all modern psychology and spirituality… It takes at least a little self-knowledge and experience to begin to understand the usefulness of this rule, to understand how many ways we have of fooling ourselves, how easily we become intoxicated and misled by our own thoughts and passions. Also, one must admit, the first rule is impossible without the second: have an all-daring trust in God. 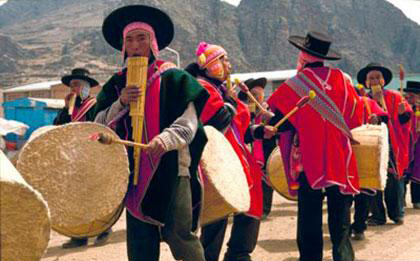 • As part of our Sacred Audio Collection, we bring a recording of one of the most ancient sacred dances of the Bolivian Aymara people, the Dance of the Kunturis (Condors), in which the combination of complex pan pipes and drumming reminds strongly of the archaic Far Eastern ritual music, such as Gagaku and Yayue Imperial Court music. • A new article by Shaykh Hamza Yusuf, “Is the Matter of Metaphysics Immaterial? Yes and No”, explores the concept of metaphysics in its relation to science, and its centrality and relevance to our times and within the context of Islamic philosophy. If one adopts a civilization’s science without understanding that it is the product of a particular worldview, one is unwittingly adopting that civilization with all of its attributes, including its social and spiritual ailments. This is not a critique of science; on the contrary, it is an affirmation that science is worthwhile when it serves a society, and it can only serve a society when its embedded assumptions are spiritually sound.